Supertramp - Crisis - What Crisis? MOTION CITY SOUNDTRACK - Even If It Kills Me............. this is not a soundtrack perse...it's a band! 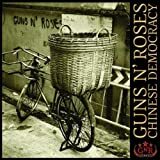 GUNS 'N' ROSES "chinese democracy"